Last week I had a gift guide for the Beauty Guru in your life and this week I have one for the Fashionista on your list. In my opinion Fashionistas are one of the easiest people to buy for because there are so many different options to choose from. If your BFF, sister, cousin, Mom, or whoever else on your shopping list is a fashion girl this list has something for them. Everything on the list is under $95.00, except for the gorgeous Tory Burch 53MM Retro Sunglasses, which ring in at $200, and are sure to get a lot of use. The second most high priced item is the Rebecca Minkoff 'My Junk' Jody Pouch at $95.00, I love this cute little cheeky pouch, it's perfect to hold little items in one's purse and is a beautiful periwinkle color. In my opinion these more luxe items are best saved for someone special like your sister or best friend. One of the easiest things to gift a fashionista this time of year is cold weather accessories. Right now pom poms hats are a huge trend and this one from Donna Salyers Fabulous-Furs with a faux fur topper is an adorable option. Another big trend this season are capes and ponchos and this BP. Plaid Poncho is one size fits all, making it a perfect gift, and is very on point right now. Scarves are always an easy gift to give and they come in a variety of different styles and price points, the one pictured here from Free People is super soft and comes in three different colors. For me though the most important cold weather accessory is gloves because I hate when my hands get cold, this pair from Halogen come in eleven(!) different colors and are touch tech friendly, they may just be something that everyone on your list needs. Last but not least, knit headwraps are an adorable options for keeping ears warm and this Betsey Johnson one is only $12.97, making it look like you spent way more than you actually did! Jewelry is also always the perfect gift for a fashion girl. My go to jewelry gift are the Kate Spade Square Stud Earrings, they come in so many different colors and go with just about everything making them the perfect present, I may or may not own four pairs myself. Kendra Scott makes the most beautiful pieces, the Danielle Earrings, which come in many different colors, and the Calvin Drusy Ring, which comes in four different color combinations, are both great gift options. Another good gift option are pretty bangles like this one from Gorjana, which is simple and comes in super on trend rose gold. One last jewelry option is a necklace, I personally like delicate necklaces and have been loving letter necklaces lately; this BaubleBar necklace is a unique spin on the letter necklace. Various accessories are also great gifts to keep on hand because you don't have to worry about sizing and just about any girl who likes fashion loves good accessories. A cute phone case is always a must have and Kate Spade makes the most adorable ones, this gold 'Hello Sunshine' case is sure to make a big hit. Another must have is a fun passport cover, if any of your friends are taking a trip this is something they will definitely need, I love this super girly sparkly one from Rebecca Minkoff. Keeping in the sparkly category this glitter clutch is perfect for your friend who loves to go out! If you want to get your fashionista more of an everyday bag, this one from Sole Society is so chic and comes in three on trend colors. One last gift that I thought was super fun to include is How to Be Parisian Wherever You Are a book written by four French women that serves as a guide to all things Parisian. Everything from shopping to dinner parties are included in here and give insight into the je ne sais quoi Parisian women have that American women want. Every fashion girl loves Paris and I'm sure this book will have all the advice she'd ever want on the subject. I hope that this guide will be able to help you with some of your shopping. With all of the great deals coming up for Black Friday and Cyber Monday now is the time to get your gifting list all in order! Do you do your shopping ahead of time or do you wait until the last minute to get it done? I've been wanting that book for forever now, love that it's on here! Fun list! 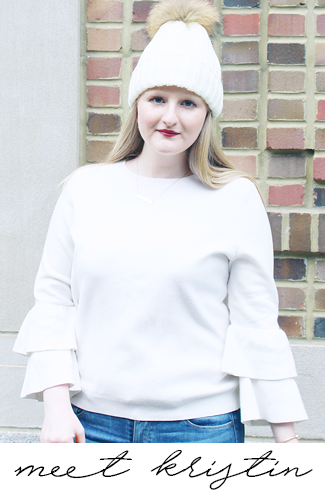 Cold weather accessories and simple jewelry are my go-to's for my fashionable friends, though I love the idea of a cell phone case or a glittery bag as well. Great picks! I love all of these gift ideas! Everything about your blog is sweet and stylish! Keep it up! Such a great gift guide... thanks for sharing!